Good Morning! 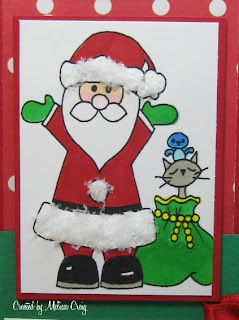 Welcome to day 4 of my 15 Days of Christmas Cards. 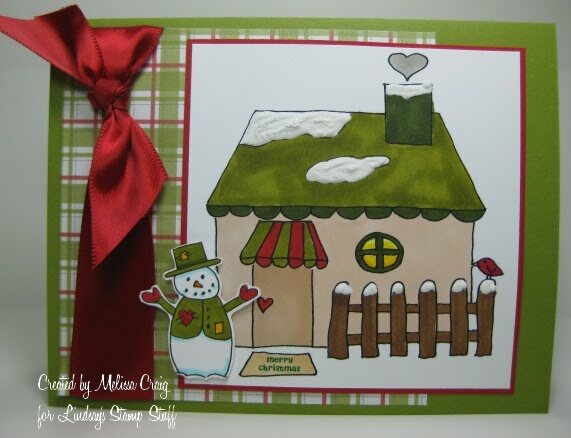 I have another super sweet, super cute card to share with you using another new release from Inktegrity. Chocolate, vanilla and strawberry ice cream never looked so yummy! Be sure to head on over to Inktegrity where these fun and super yummy images will be available for purchase. See you here tomorrow. Good Morning! Welcome to day 3 of my 15 Days of Christmas Cards. I have a super sweet card to share with you. This features a new image that will be available on Dec. 1st from Inktegrity. What could be sweeter than a mint sundae?! I recycled an older sketch of mine that was created for Tuesday Morning Sketches. I was excited to find that I still had a couple of peppermints brads in my stash. 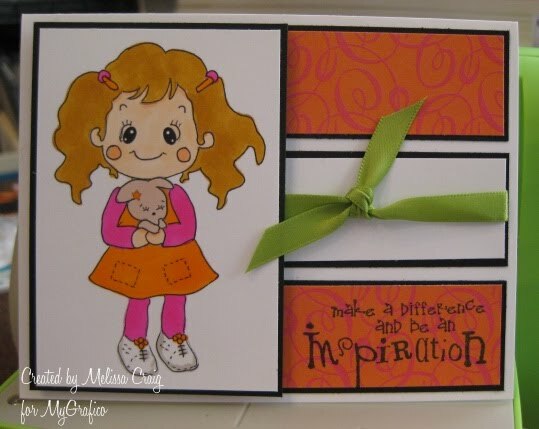 This is a really simple card to create using my favorite Cuttlebug Folder and ribbons. Good Morning! Thanks for coming back for the 2nd day of Christmas Cards. I don't know if I've ever shared that I love snowmen. (giggle) This card I made using a very interesting technique. I'm not quite sure where it originated from, but I saw a card using this technique, so I had to try it myself. 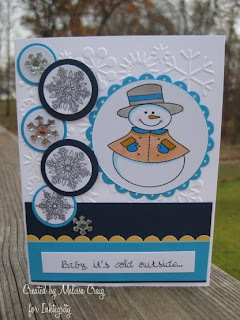 I used an image that I got from Cuddly Buddly and I used Inkadinkadoo called Snowflakes A Plenty. I stamped the snowflakes on the smooth side of a clear transparency (inkjet) with black Staz-On ink and let it dry. Then on the reverse side (rough) I sponged white pigment ink, then sponged two dye-ink colors and then went back over that with white pigment ink. I quickly covered the wet pigment ink with clear embossing powder and heated. I backed the image with a piece of white card stock and then used brads to ensure the acetate stayed put. Then decorated the front. It was a fun technique and I think it has a lot of possibilities. Thanks for stopping by and I look forward to another visit. Good Morning! Happy Black Friday! I don't normally go out on Black Friday, but this morning I actually did and it wasn't that bad. I got what I needed to get and I know a little girl who is going to be very excited Christmas morning. So what is my title all about? Especially when I've been showing Christmas cards quite often these past few weeks... well, I've been inspired to by Kristina Werner who has been doing some awesome videos on Christmas cards and I want to challenge myself to do the same. I will still be posting for my DT obligations, hopefully incorporating this theme and of course, participating with my favorite challenges when I can. 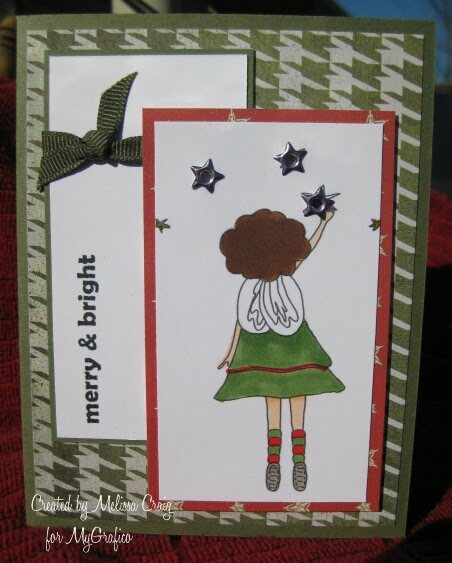 So up first is a pocket card, the tutorial can be found here on SCS. It was a simple card to create. I used the ornaments from the Winter Kit from All That Scraps (hurry, they are on sale today) and a snowflake that I received in a theme kit swap. My photo didn't quite capture the glitter that I covered the snowflake with. The piece where the ornaments are at is a pull out and then I left the lower pocket empty for a gift card. Thanks for stopping by and we'll see you here tomorrow for another Christmas card. Good morning! Happy Thanksgiving to you. Yep, I'm still here to post my LSS card and I know this isn't very humble of me, but I am so PROUD of this card! I used the Primitive House image with just a few alterations. First of all, I erased most of the flower image on the left of the house and then I removed the "welcome" part on the mat and added in Merry Christmas. 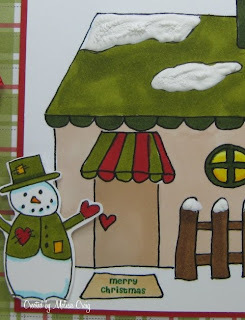 I used Copics to color the image and then used white Puffy paint to add some snow. 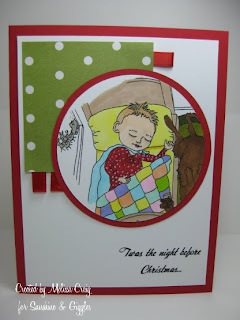 The plaid paper is from DCWV Christmas mat stack and the base is Old Olive. Here's a close up of the snow detail and another reason why I am most proud. Do you see that snowman? Cute, right? I DREW HIM!! I can't believe I actually created my own "stamp." I know I'll never be able to do it again and it was probably really dumb of me to use my original drawing. But I did it! I really wanted a Primitive looking snowman and couldn't find one, so I made it myself. Yipppeee!!! Don't forget to stop and visit Lindsay and the rest of the team. Take a break from the Thanksgiving festivities... let the guys watch football in their bellies-are-full-catatonic state and see what the girls have to share with you. 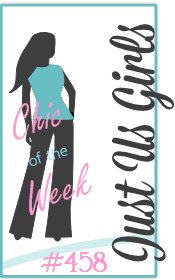 I do know Lindsay has a very cool freebie this week, too. Oh! An announcement, too!! 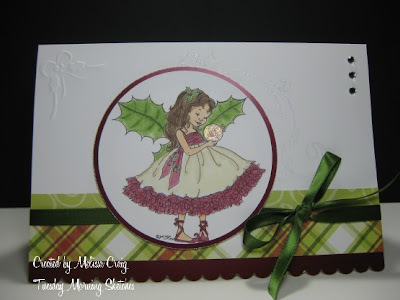 Lindsay is hosting a challenge over at MyGrafico Community, so be sure to join the group and get in on the action. And MyGrafico is having a sale today - everything is 20% off!! Thanks for stopping by and I wish you and your family a very Happy Thanksgiving. Good Morning! It's so quiet this morning. My children are sleeping in so I'm enjoying my coffee and the silence. Today is the sketch installment of the MyGrafico Challenge blog. Be sure to visit the blog for all the details. We're still using Dotti Stamps and a recycled sketch from my Tuesday Morning Sketches blog. Remember this one? I love this sketch... but I didn't follow it very closely. I decided to not do the scallops on the side, I flipped the order on the side panel and the 3 elements on the top I brought down into the image. So here's my card. I colored the image with Copics and the sentiment is from the Winter Kit from All That Scraps. I also incorporated the P.I.E. challenge, rather basic, but it's there. I hope you join us in the fun this week! Thanks for stopping by. Good Morning! I hope you're well today. My children were very happy this morning that this is the last day of school for awhile. They were groaning just a little but they'll be OK. I just want to take this time to reflect on what I am thankful for during this Thanksgiving season. I have many blessings to count... I have a wonderful hubby and children, my sisters who are my best friends, and friends that are the best. I am thankful that we still have the freedom to worship freely and am very thankful that we have a God who loves us. I am also thankful for my stamps - they are my therapy and enjoyment when my family is away. Here's my Thanksgiving card using Inktegrity's adorable turkey and pumpkin images. Of course I am participating in a few challenges. I colored the images with Copics. I did use the little acorn from a PTI set (Limitless Labels) and I used the Argyle CB folder for the pumpkin pie card stock piece. 1. Friday Sketchers - the sketch. Wonderful! 2. Just Us Girls - the color combo. Bashful Blue, Pumpkin Pie and Really Rust. I was very excited to see that I still had a few scraps from SU! paper pack Apple Cider, at least that's what I think it was called. 3. Stampin' Sisters in Christ - make a Thanksgiving card. 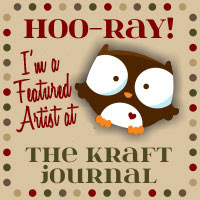 I also want to invite you over to my challenge blog, Tuesday Morning Sketches, for a fun sketch and wonderful sponsor!! Good Morning everyone! Happy Monday - should be a short week for some with the Holiday this week. Can you believe it's already Thanksgiving? Ugh! 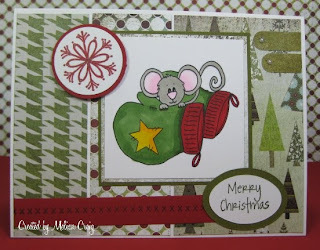 My card for today's Sunshine Monday installment is featuring an adorable stamp in the Christmas collection. It's called A Visit from Santa. This sweet little baby is snuggled in bed and just outside the window Santa is stealing away in the night, off to make his next visit. I used a sketch from a site that's new to me. Great sketch and a challenge blog I hope to visit more often. It's called The Crafty Pad. They also have a store of some really adorable images, I'd never heard of this stamp company before, but they are definitely worth exploring! I colored the image with Copics and Prismacolor markers. The sentiment is computer generated that I strategically placed in my word document so that it printed where I could easily trim the entire piece to layer over the base. My daughter was upset me with that I cropped the dog out. You can find the new home for Sunshine & Giggles here. Don't forget to visit Janice and the rest of team to see what they have to share with you. 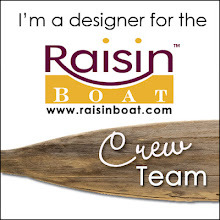 And there's still time to apply for the Design Team, too. Hi everyone! Happy Saturday to you! I hope you're enjoying the day. I have despite going grocery shopping. It's the only chore I did today. 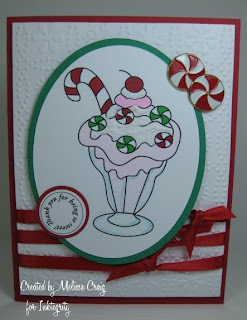 I did make a couple of cards, the one I have to share with you today is for two challenges for Sweet n Sassy Stamps - their The Sweet Stop sketch challenge and the December COTM on the Yahoo group. Sweet Stop said to follow the sketch and add stitching. Since my sewing machine is in dire need of repair I did just a little faux stitching on the strip that "leads" into the sentiment. I received Cocoa's Mittens for participating in SNSS Digi Day on PCP. Oh my goodness, this mouse is sooo adorable!! I colored the image using Copics. 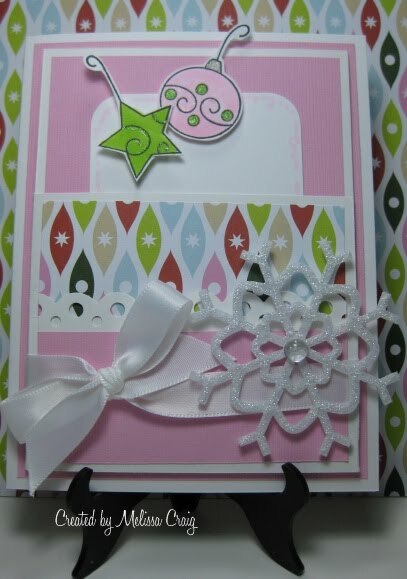 I stamped the snowflake in red and then carefully outlined it with Copics Spica glitter pen. The sentiment is from the Winter Kit from ATS. I am very happy with how the card turned out. Hi All! Thanks for coming by for another visit. I have a job interview this afternoon and I really hope that I get this job. Actually there are 3 that I've applied for that I would love to have. Anyway, I played along with a couple of challenges using Inktegrity's newest image - Teddy. He is darling, his face is so loveable. 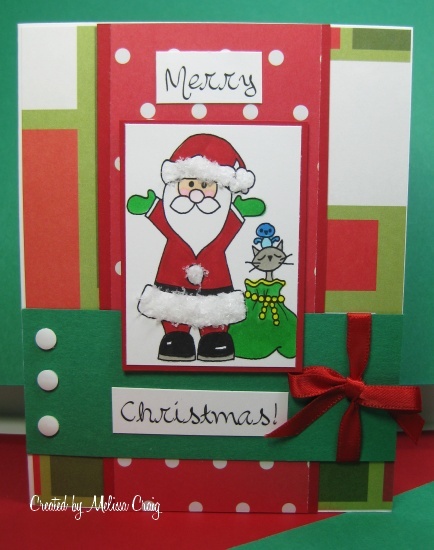 I also played along with Dutch Dare Card Challenges which was to create this pocket card and I am not sure that I completely understood the directions (I am such a visual person, I'm pathetic, I know) but I am happy with the way it turned out. Very cute. I also played along with Color Throwdown (one of my favorite challenge sites) which was to use Chocolate, Olive (opt), Cream and Dark Red. I used all three plus a little white. This is the front view - I used SU! decorative paper from, gosh, I think a couple of years ago (yes, I hoard that bad! ), Old Olive for the scallop, Chocolate Chip for the base and I printed the image on Neenah Classic Crest card stock. I colored it using Copics. The "tab" was created from one of the ornaments that came in the Winter Collection from All That Scraps. I did cut the hook off of it because I figured it wouldn't travel well. Here is the inside pull out where my greeting is. I created this in a word program using a cute font called Allura Script (dafont.com) that says "Wishing you a beary Christmas and a New Year filled with blessings and comfort!" How I did this without using up a lot of card stock was, I opened up a Word Document and typed my sentiment. Formatted it with the font and about how I wanted it to look on the page. Then I printed it on plain white paper. Then I took the piece of card stock I wanted it on and using some temporary adhesive, I adhered the card stock over the printing. You need to adhere really well. And then printed again. I hope you enjoyed my card. Have a great day! I just had to post this because I love it so much! I participated in a couple of challenges. Sweet Sketch provided a wonderful layout for this card - it worked so perfectly!! Arlana, you are truly an inspiration to me when I create my own sketches. I used DCWV Christmas stack decorative paper, Neenah Classic Crest, Glorious Green and Real Red card stocks. I colored the image with Copics. Here's a close up of the image so you can see the Flower Soft (polar white) that I added to his hat and coat which is the medium of texture I chose to use. I love this stuff. I also recently watched a video on how create your own faux Flower Soft by using styrofoam balls. I'm still in the process of grating the styrofoam but so far this is proving to be a great alternative. I hope you like my card and don't forget to visit these great sites for a bit of fun. 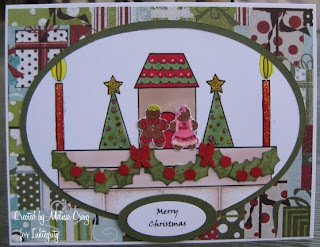 Lindsay has another fabulous Christmas release for you today - I love this set! It has so many beautiful Christmas Ornaments and a wreath. 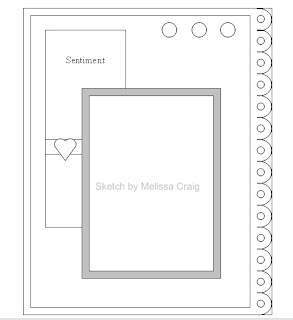 You're definitely going to want this in your digi-stamp stash. 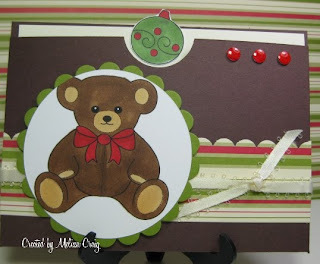 Visit Lindsay's blog here to see it in detail and snag a freebie. I am still trying to figure out how to print a perfect circle, so far I'm still struggling. 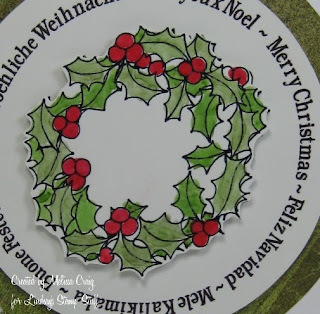 But I imported the circle sentiment and then layered the wreath over that. And also printed another wreath. Did I tell you that embossing is truly possible with digi-images? I printed the images on glossy white paper (this will only work with ink jet printers) and then sprinkled clear embossing powder on and then heat set. It works beautifully! I rather hoped that a close-up would show you that I really did heat emboss. 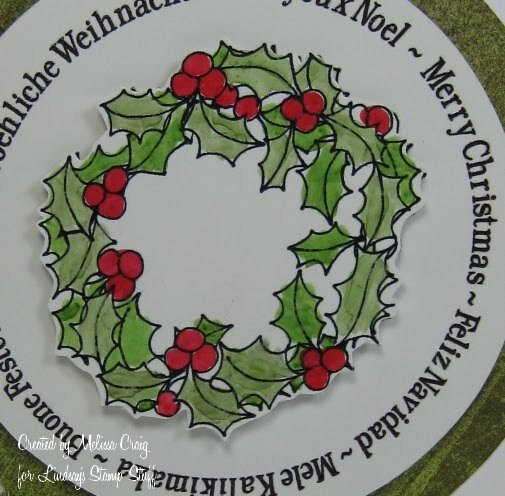 I colored the image using Copics and then layered the wreath with pop-dots. This is a really simple card and very easy to make several of if you're mass producing. Thanks for stopping by - don't forget to visit the other team members that I am certain will have many more Holiday ideas for you. They are linked in my side-bar. Enjoy your day. Good Morning! I hope you all are having a great week so far. This is the sketch addition to this week's MyGrafico Challenge Blog challenge and boy this was is a challenge. 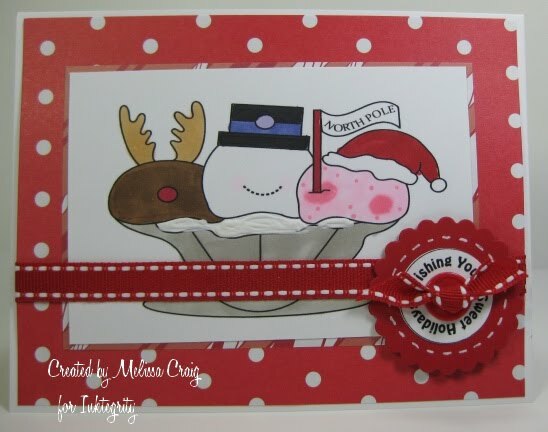 We are using the adorable set by Dilek Design Studio and the challenge is color combo... Pink, Green and Orange. Yowza! And now we're throwing in a sketch! Mary made us a great sketch to follow! So here's my take on the card. I found it sort of hard to put these colors together - but it was rather fun and the card certainly came out really cheery. I hope you join us this week! 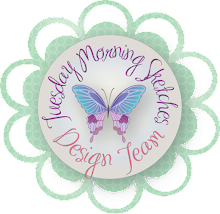 Just a quick invitation to head on over to Tuesday Morning Sketches for this week's challenge. 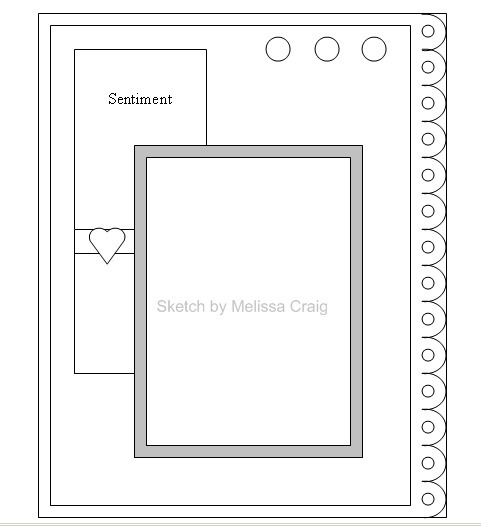 We have Mo's Digital Pencil Too sponsoring and her images are FABULOUS! I used the Holly Fairy image, which I'm sure is quite popular right now. She is so beautiful! I colored her with Copics and Prismacolor pencils and OMS. 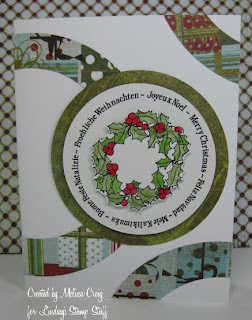 The challenge is a recipe challenge, 3 decorative papers (doesn't include base), 2 embelishments and 1 flourish. My flourish is there, click on the photo to zoom in - but it is rather subtle. I hope you join us this week for the challenge. Good Morning! I hope you all had a fabulous weekend. Oh my goodness, yesterday was GORGEOUS!! The sun was shining, it was warm outside - we were able to open the windows to air out the house and listen to the kids play outside. Love it! So not the weather that my sisters were experiencing in Denver. When hubby was checking the Weather Channel at 9:00 this morning or so - Denver already had 7" of snow. 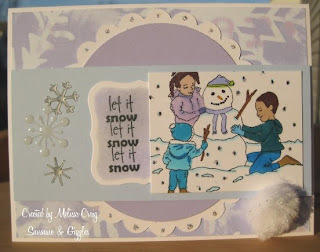 Their winter blizzard is where my card fits... Today for Sunshine & Giggles I'm featuring a stamp I've already shown you before, but I just love it! 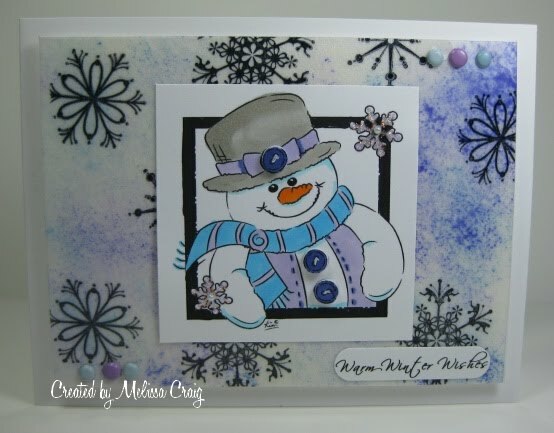 And it also fit the wonderful sketch and recipe challenge from Crafts 4 Eternity (sketch, snowman and cotton wool). I also have a very exciting announcement to share. Not only does Janice have a bright and shiny brand new blog and now the entire Winter/Christmas line is available in digi-stamp format!! Whoo-hooo!!! Prices are ranging from $2 to $3 for the digi's and you'll receive an email with a link to download your purchase. Awesome!! Also, Janice has a monthly special on her adorable football image from her original collection. And don't forget about the design team call. Janice is wonderful to design for, she's so sweet. Thanks for stopping by today - I do so love your visits. Today is my dear friend Joni's birthday so we, her faithful team, decided to have a little virtual party for her and here's the card I made to celebrate Joni! 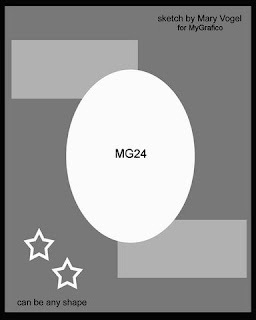 I used Inktegrity's newest images and current challenge to create my card. The base is the Mantel that you can grab as a freebie and get in on the challenge. I then added the slice of cake and presents from Little Helper to the mantel. I created the Happy Birthday banner using a font called Brady Bunch Remastered (dafont.com), cut them out and then glued on to create a swag banner and drew in the string with my Copic liner. I did also draw on a couple of other challenges to help me create this fun card. 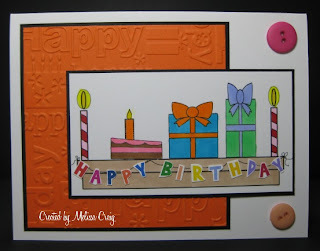 The challenges over at Just Us Girls and The Corrosive Challenge Blog is to create a card using embossing, so I ran a piece of Only Orange (Joni's favorite color) through the Cuttlebug with the Happy Birthday folder and I found this great and so friendly sketch at Scrap 'n Stamp (a Canadian online store). Another late post but only because I'm a ditz! I didn't have it in my head that today was the day Joni was going to announce another challenge. Or maybe because this was such a challenge for me. 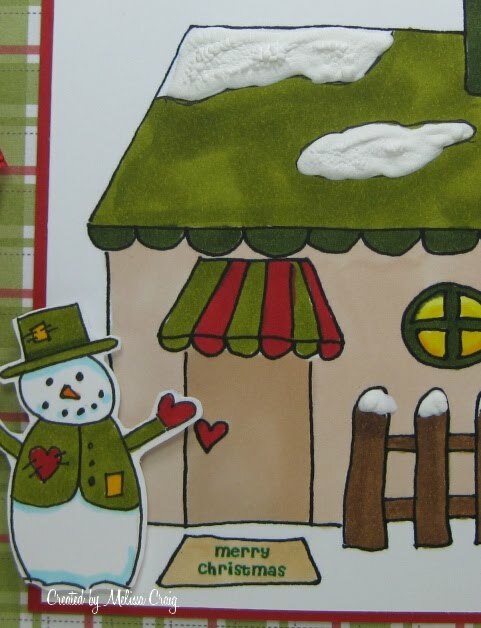 I colored the image with Copics and Prismacolor Markers and then had a blast with my stickles (so this fits Cute Card Thursday's challenge to use glitter) to decorate the trees and the candles. I punched out the holly leaves and berries to create the garland. I had to free-hand the bows because I couldn't find any thin red ribbon. Me! Can you believe it?! The stash of ribbon that I have and no thin red ribbon. Ack! I did use a Gingerbread couple from The Daisie Company and I still didn't get them small enough. But any smaller and I would've gone blind. I also created bricks to go under the mantel, too. The greeting is computer generated. 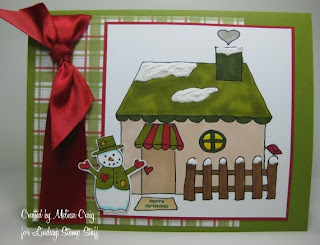 Well, I hope you like my card and that you'll try Joni's challenge this week! I look forward to seeing how you decorate the mantel. Good Morning! I have a late post today because my kids were home yesterday and I didn't get anything done! Oh well, I enjoyed the day. 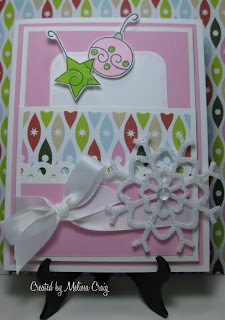 Today's Thursdays with Lindsay card is from a tutorial I followed on SCS for a recessed card. When I first watched the video I thought to myself that I would never do that card. Then I watched again. I've had a few chats with my friend Joni and we've been talking about "raising the bar" in our crafting. So with her words echoing in my head, I decided to try the card and I love it!! It's a bit crooked, but that's OK. I featured her set called Leaf Prints that she released several weeks ago. She is releasing a new set today, but what I wanted to do with it, I needed more time then what I had. And this fit a couple of challenges. The first challenge is for The Pink Elephant with a theme this week of being thankful. The other challenge is from The Color Dare to use Chocolate Chip, Bashful Blue and Really Rust. A color combo I don't think I would've ever put together on my own. This photo doesn't do the ribbon justice - it's a very rich rust color ribbon that I hoard as much as possible. There's not a lot of embellishment because I wanted to keep it clean and simple and I wanted to be sure the leaf print paper wasn't hidden - it's too pretty to cover up. Be sure to visit Lindsay for today's release and freebie. Don't forget to visit the rest of the team to see what lovely treasures they have to share with you today. Hi there! Quick post today - the kids are home from school. Happy Veterans Day! I'm not sure if you remember me saying the other day about Hollyanne's Friday Feature that she reminded me of a stamp set I have... well in the set are these great stitching stamps. How easy can this be?! 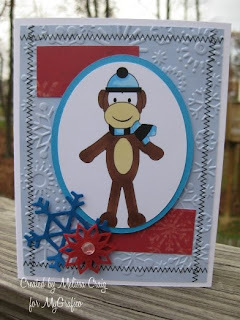 This sock monkey is too cute and I really stepped outside my comfort zone and put this bold red with these cooler shades of blue. So not like me and I so like the results. I hope you do, too. Give it a try and be sure to link up so we can see. Oh! And there's only a few more days left to apply for the design team. It's been a pleasure and so much fun to have been on this team. You will love it! Have I ever told you that I am such a sucker for snowmen? Well, I am! Winter and I get along only so-so. I don't like being cold, but I love the snow covered Rocky Mountains. I love the powdery snow that glistens like diamonds when the sun is shining, not great snow for building a snowman, but beautiful to look at! But I don't like ice! That's what we get a lot of out here in WV, ice - not much snow. But there's nothing more heartwarming than a snowman built by children's hands with such love and detail. I love this snowman from Inktegrity. It's part of the Little Helper set that released last week. I just had to play along with a couple of great challenges... First challenge was the sketch from JUGs - great fun! The second challenge is from Digital Tuesday which is to create a holiday greetings card and what better way to greet the holidays then to start singing a favorite Christmas song of my Mom's. The snowflakes I found when googling coloring pages. I hope you like my card - thanks for the second visit. Good Morning! 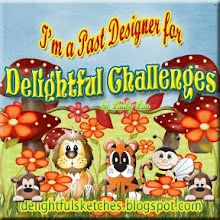 The card I have to share with you today is from my challenge blog, Tuesday Morning Sketches. If you've never visited, you really should. I have fun sketches (in my humble opinion) and GREAT sponsors!! Prizes every week! Make sure you click on the photo so you get a better look at the detail. I created this card by first cutting the brown circle base using my Coluzzle big circles template. 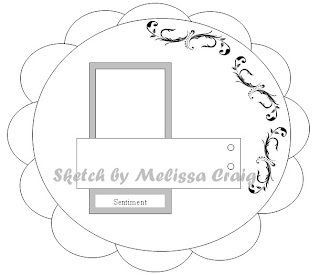 I also added doodles with this really cool template from Chatterbox that I think I added dimension to the "center of the flower." The image is colored with Copics. The sentiment is from Unity. My son looked at my card and said that bear doesn't look like he's feeling very blessed with all those mice on him. I laughed and said he's blessed with all these friends! OK, then I punched out 1 3/8" circles and ran them thru the Cuttlebug with the Distressed folder. I sponged each circle with Summer Sun ink and then adhered to the back of the card. Then to secure and finish the back, I cut a big circle and adhered over the little circles. I'm also very excited that my sketch works with Humble Pie's challenge, too, to create a round card. 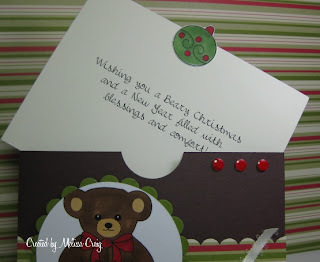 I hope you enjoyed my card and I really hope to see you over at my challenge blog.